Macedonia - Razlovci 1876 - Kresna 1878 - republic-of-macedonias jimdo page! 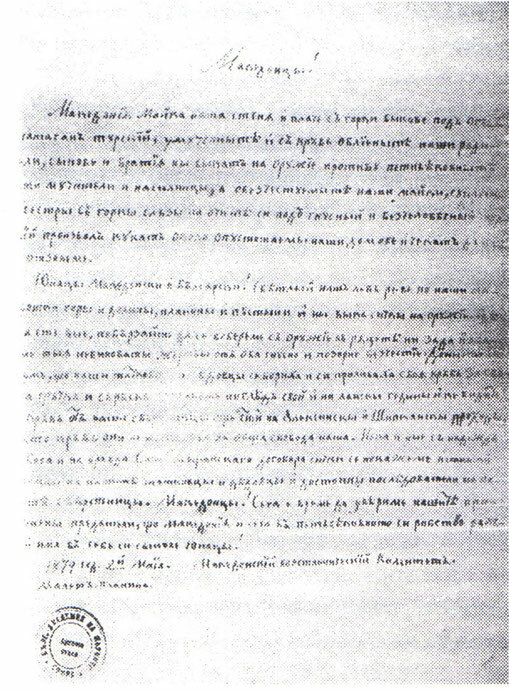 The first page of the constitution of the Kresna Macedonian Uprising in 1878.The Prescripts of the Macedonian Rebel Committee were formulated, it is believed, at the beginning of the second phase of the Macedonian uprising in Kresna. The commander of headquarters, Dimitar Pop Georgiev, was again among the rebel ranks when the capital document was drawn up. They proclaimed the social, national, and philosophical aims of the uprising. 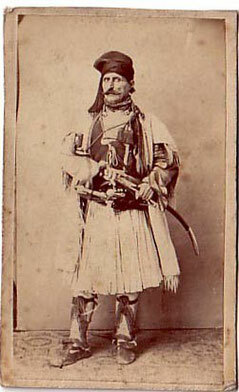 They were the logical expression of the theretofore subjugated Macedonian nation, a declaration of cultural and educational emancipation, of individualization, of independence, and of cooperation with other Balkan peoples,...[...]…They represented the expectations of the harvest of war, and they envisaged the open spaces to come. The ultimate aim was to create in independent Macedonian state in which social rights would be respected, and all residents would be equal before the law regardless of faith and nationality. In their international relations, they sought enduring equality, peace, and loving cooperation. The framers of the Prescripts expected, and rightly so, that the creation of a Macedonian state would be a positive factor toward eliminating the rivalry among the Balkan states, toward cooperation on the Balkans, toward equality and mutual respect. A transcription of the Prescripts was kept in the private library of the late Bulgarian Patriarch, Kiril. Archive Department. Volume 2341 AE 50; L 30-60, Sofia. The Patriarch, Kiril, himself brought the transcriptions to Sofia. The Prescripts have yet to be published in Bulgaria. They contain 211 Articles. Preamble We will introduce the reader to the Prescripts with a summary of the most important sections. Macedonians and who have a love of freedom. Article 3: All residents of Macedonia, regardless of nationality or faith, can take part in the uprising - but they must love freedom. Article 4: All those from countries, neighboring and distant, who want the best for Macedonia can take part in the Macedonian uprising. But they must honestly commit themselves to the freedom of Macedonia, and they must submit to the authority of the Macedonian Rebel Committee. Article 7: For the indolent, the thieves, and the ignorant, there is no place among the Macedonian rebels, as there is no place for mercenaries who are as savage as the Turkish bashibozouks and who appear out of the great unrest among the people. Such volunteers are unnecessary to the task at hand. It would be better that they go back from where they came. Article 9: The aim of the Macedonian uprising is no secret. It is for the liberation of Macedonia, the country of the…[…]…enlighteners and educators, St. Cyril and Methodius, the country that has suffered centuries of Turkish enslavement. So, among us there is no place for those who fight for personal gain, there are places only for those who fight for freedom. accepted into the uprising. But first he must swear an oath of honesty and faith to the Rebel Head Command. Then he will be signed into the numbers of the rebels. Rebel Leadership will be prosecuted in the name of the Rebel Command and will be executed. contrary to the uprising and/or the Rebels will be prosecuted and punished. Macedonian Army during battle; when peace returns, they will return to their work. task will be to arm every able-bodied peasant, to know the whereabouts of every resident, and to call them to arms for the Macedonian army in time of need. The commission will not accept bribes to release anyone from his duty. Anyone caught offering or accepting bribes will be executed. villages. The officers will draw up a document, as a Constitution, to determine who will govern the area. Article 32: According to this Constitution, the officers as a regular army, always prepared, for this order appears to be fair to all. two changes every ten days. Land owners are not to be exempt from guard duty, for it has been observed that they tend to shirk their duty to the fatherland and, still worse, spread rumors that excite the residents. even if the town is Turkish. Each rebel will carry food in his own pack, and in the event the supply units fail to arrive and he is without food, he must endure. He who enters into a Turkish house to look for food or anything else will be treated as a looter and will be punished by death. 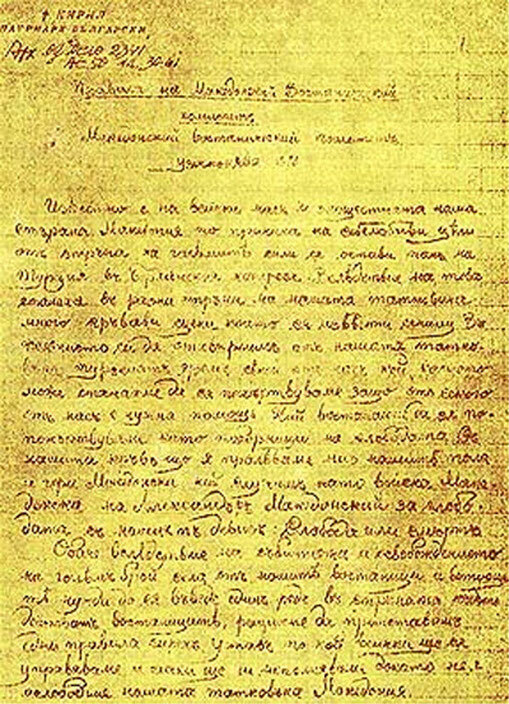 Article 58: All peasants who give food and other supplies to the Macedonian volunteer army should demand an official receipt, for they will be reimbursed after the liberation. Rebel Headquarters. We have people and fighters, but we don't have weapons. Rebel Headquarters are not to be accepted by the hundreds into the detachments. Determine who has been sent as a spy, and send the spies back. Article 71: If it becomes apparent that one is a spy, or a propagandist, or a bandit having come from Turkey, Greece, Bulgaria, Serbia, Russia, Bosnia, or wherever, determine who sent him, to what end, and what he has done while a member of the rebel forces. He is either to be punished according to the gravity of his deeds, or to be sent back. Article 72: If it is determined that a volunteer already accepted into the ranks of the Macedonian volunteer army is a spy for another country or has worked against the aims and interests of the Macedonian uprising. He is to be punished as an internal, according to the laws of the Macedonian Rebel Army. Article 102: No one but the Macedonian Rebel Headquarters is to negotiate with the enemy for the surrender of the Macedonian army or liberated territory. Should anyone bring such a decision, the army is not to honor the order. The person or persons bringing such a decision are to be sentenced to death, and the execution is to be carried out publicly before the village. Article 125: From what we have seen, it is impossible to bring all of Macedonia into the uprising. Macedonia. 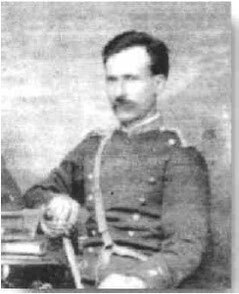 Now we are conducting partisan warfare against the Turks, but our intention is to send rebel detachments into Macedonia to incite an uprising there as well. Our first detachment will leave for Bitola to initiate activity there. The detachment, consisting of 300 rebels, is led by the voivodes, Karaiskaki, Stevo, Pavl�, and Kara Kosta. That detachment will act on its own authority in carrying out its orders. With couriers it will inform the Macedonian Rebel Headquarters and will seek whatever council necessary. Article 126: When the first detachment reaches the Mariovo Mountains, it is recommended that the voivodes accept local residents into their ranks. That will constitute the rebel army in that area. Macedonia. In compliance to the authority, all areas will rise up and rebel. 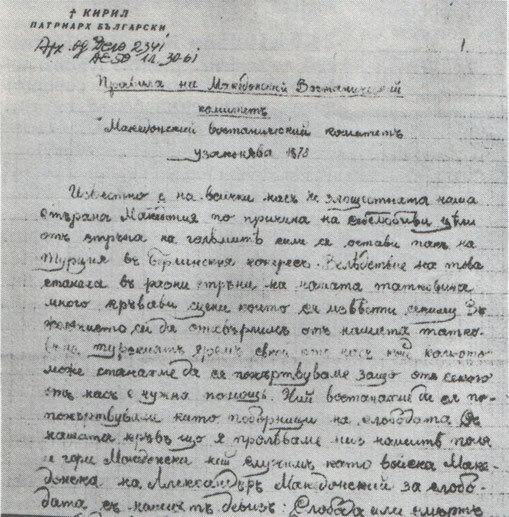 Kostur, Maleshevo, in the Prilep and Veles areas, in the Dzhumaya region, in Skopje, and in other areas throughout the fatherland, the Macedonian Rebel Committee, as a central command for all of Macedonia, recommends all voivodes to report their assessments of the situation to Headquarters for the benefit of the general uprising. Article 132: Our Macedonian uprising is an internal affair, and we are commanding our own forces. Our neighbor, the Bulgarian Principality, is not demonstrating a brotherly acceptance. They are sending our messangers back without weapons. We are left without enough, and we cannot aid our own brother Macedonians in Macedonia. Thus, we are compelled to advise them about supplying weapons and about patronage. uprising and attack the Turkish forces from the northern border. However, there are no weapons. If they can find weapons, and if they accept our Constitution with their hearts, we will accept them. Article 139: By consent of this general assembly, composed of representatives from all committees throughout Macedonia, this document will now stand as the Rebel and Civil Constitution by which we will be governed and which will be enforced until the liberation. Civil Rule Article 140: Provisional civil rule is to be introduced in the liberated areas. It will govern the social life of the residents. It will be established by the first people selected by those to be governed. Central Committee and it will consist of five members. Article 142: Each inhabited area is to have a joint committee subordinate to the Central Committee. This joint committee will consist of up to five members as determined by the Central Committee. uprising to the ruling officers and to the people. The local committees are to govern the people with secular rule. Article 145: After the liberation of the fatherland, the Central Committee will create a Constitution by which the Macedonian state will be governed: either within the Ottoman Empire as a state with political and cultural autonomy; or, if the Great Powers of Europe permit, outside the Ottoman Empire. Article 151: Most strictly forbidden is the feudal system of owning serfs tied to the land. Those who worked the land are now the owners of that land which the land lord and his family cannot work alone. distinctions among the nationalities because all are equal citizens and all are under the protection of the laws of Macedonian civil rule. Article 163: For denegrating a church or mosque, the punishment is death; for the plunder of sacred Muslim property, the punishment is double compensation and a beating. village to settle the lesser matters among the peasants. Article 182: The Macedonian uprising is an internal affair, but it won't succeed unless we convince Europe of our fight for liberation. The uprising will be represented outside Macedonia to the European states by the Macedonian Rebel Committee and the people appointed by the Committee. Article 183: With minutes of its meetings and other material, the Macedonian Rebel Committee will seek, in the name of the Macedonian rebel, to convince Europe that the uprising in Macedonia is born of necessity and is to the benefit of all. Article 184: European states already speak of the uprising as having import beyond the interests of our people. The responsibility of the Macedonian Rebel Committee is to explain the aims of the uprising, to capture the truth. Our struggle is for the liberation of the Macedonians, not to advance the causes of other nationalities residing in Macedonia. 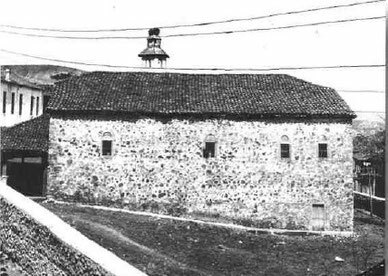 Principality that the Macedonians have no intention of interfering with the Principality,...[..]. deputies, and the Principality can send its deputies to the Committee. affairs to the European states so that they will recognize the legitimacy of the Macedonian uprising. The memorandum will include a statement of belief in the righteousness and benefit of our sacred deed. We do not despair. Rather we continue energetically and tirelessly toward the achievement of our goal: the liberation of the Macedonians from Turkish enslavement. Our struggle is made necessary for the Turkish government refuses to honor Article 23 of the Berlin Treaty. Macedonia. If the Prince of the Serbian Principality permits, we will send them our deputies and the Committee will accept theirs. weapons and materiel to bring our Macedonian uprising to a successful close. Article 193: The Committee will humbly request the Serbian Prince not to impede our Macedonians in Serbia from taking part in the liberation of their fatherland, to give them arms, and to convey them without interference to the border. Macedonian uprising and that they will permit Macedonian volunteer detachments to be sent from Greece. toward themselves. The Macedonian rebels' attack on the Turks will also aid the liberation of Epirus and Thessaly. Article 197: The Macedonian Rebel Committee will call into brotherly understanding the Albanian flag bearers and their people's leaders to rise up in defense of the freedom of their fatherland, to fight for their freedom, and to join forces with the Macedonian rebels. 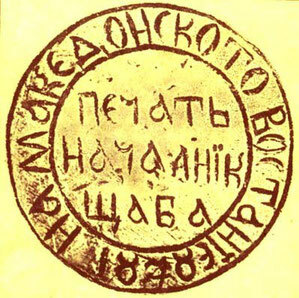 Article 200: The Holy Bulgarian Exarchy, with His Highness at the head, is carrying out the most extraordinary policy. While purporting to have Macedonia's best interests at heart, he maintains close and friendly relations with the Turkish government in Constantinople. And Macedonia is still under the direct power of the Turks. Perhaps the Exarchy thinks that by gratifying the Turks, they may be able to win their favor so that the Exarchy can send religious leaders to Macedonia. And in turn these leaders will protect the Macedonian residents from Turkish pressures. It is difficult enough for the Macedonian without having to suffer a policy such as this that will tend to divide the people. 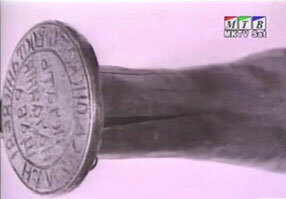 The Macedonian Committee objects, for the Macedonian needs both hands to fight for his freedom. Exarchy orders and to join the uprising of the Macedonian people until the liberation is won. Afterwards, ecclesiastical issues in Macedonia can be decided. Article 202: The Macedonian Rebel Committee will send a delegation to His Highness, the Exarch Josif I, in Constantinople in order to request that he will not interfere in the Macedonian uprising - unless he wants to be included among the ranks of the traitors. Miletiy, who has inflicted extensive damage on the work of the Macedonian uprising, to bring a halt to his efforts. Should he refuse, he will not be protected by the Prescripts. Article 205: With the introduction of these Prescripts, our Constitution, into binding law, we hereby declare that the Sofia Committee will in the future have no authority over the Macedonian uprising. uprising will be led by the Macedonian Rebel Committee from Macedonia. Article 207: The Macedonian volunteer army will in the future be under the direct command of the Macedonian headquarters of the uprising. The headquarters will order the mobilization of the forces, will supply them with weapons, and will lead this sacred war for Macedonia's freedom. Article 208: The Macedonian Rebel Committee orders all Macedonians to abide by and to fulfill all regulations stated in these Prescripts, our Constitution, without hesitation until the liberation of Macedonia and until a peacetime Constitution for an autonomous Macedonia can be formulated. attitude of the Russians towards the Macedonian revolutionaries is no exception. message was sent that Russia will not help the Macedonia's. Russia was insisting that its intentions are peaceful and that it fully support the ongoing Austro – Russian reforms in Macedonia. Different Committee were formed inside the Pirin Macedonia. Under the cover that they are only sponsored by the Bulgarian Government, but in reality were Bulgarian Spy's who had only one aim, to display the Macedonian Uprising with Bulgarian character. 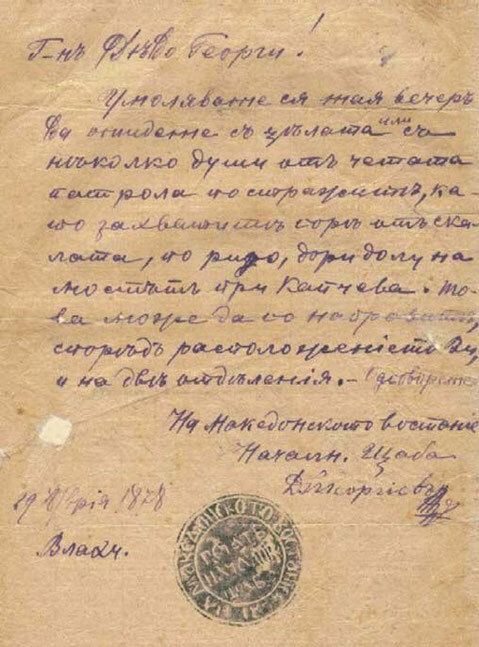 In order to display the Macedonian Uprising with an Bulgarian character, letters were sent to the Committee's in Macedonia, where the designation Macedonian were left out. On this, A. Kalmikov, the Speaker of the Committee in Dzumaia sent the following letter to all Committee's. “To the Dzumaia Macedonian committee! I was elected by the People and Army for Spokesman of the Macedonian Revolutionaries.I appointed Dimitria Pop Georgiev for the leader of the headquarters, and with this I inform all Committee's. 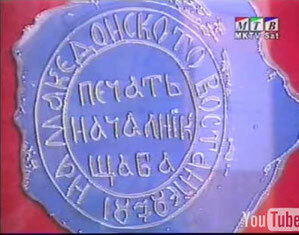 You all restrained your self to write “from the Macedonian Committee of the Revolutionaries”. But this name will not die, and that's why I inform you that with out the word “Makedon” your letters will be returned- please inform the other Commitee's. postal and administration units in the new gained territories. Your committee should obey to the above mentioned commission which is representative of the central Committee. This means that you should comply to the instructions to this commission for arresting D.P. Georgiev. When you inform us about accomplishing the task, your committee will be put through inventory with the commission and the central committee. When I pray to god I pray for you, Maletija. One of the co-fighters and co-organists of Dimitria Pop Georgiev was Iljo Maleshevski. Македониїя майка наша станА й плаче съ горки выкове подь огънтъ и іатаганъ турскій. Умученнытъ и съ крвъ облеаны наши родители, сынове и братя ньі выкагъ на оружіе противъ петвЬковнитЬ наши мучители и насилницы, а обезчестеныте наши майки, супруги и сестры съ горкы солЬзи на очитЬ си подъ гнусный й безчеловЬчный турскій произволъ кукатъ около опустошаемй наши домове и чекать да имъ се отзовеме. Сега е време да увЬриме нашитЬ просвЬтены предатели, ψо Македонiæ й сега в петьвЬковното си робство ражда и има въ себе си сынове юнацы! 1879 год. 2-й Маіа Малешъ-Планина Македонскій возстанническій Комитетъ". Извор: Научен архив, Българската академия на науките, София, (НА-БАН-С), Фонд: Сбирка IX, оп. 1, а.е. 55, л. 1." Macedonia our mother arose and with bitter crys under the Turk fire and yatagan. Our suffering and with blood covered parents, sons and brothers are calling us to take up arms against the fife centuries enslavers and violators, and our descrased mothers, wifes and sisters are crying with bitter tears in their eyes under the dirty and undisent Turk lawlessness and cry on our devastated homes and wate for us to respond to them. It is time to convince our educated traitors, that Macedonia can even now, after fife centuries of slavery, still give a birht of and have in it self Heros! Фонд: Сбирка IX, оп. 1, а.е. 55, л. 1.